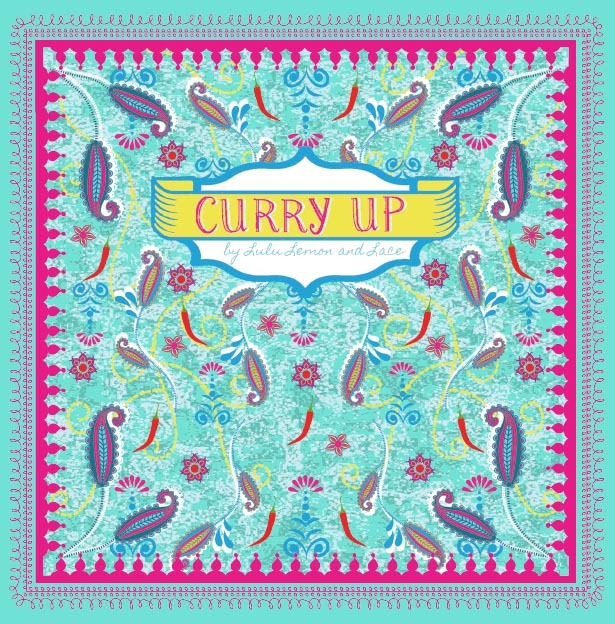 “Curries have become a mainstay of western cuisine and are adored by millions, yet the recipes and spices still elude even the most ambitious of cooks. Lulu opens the door on this mystic world with easy to follow recipes, explanations and stunning photos. The easy going feel of the recipes pulls you in, you will soon discover that you too can achieve authentic flavours. 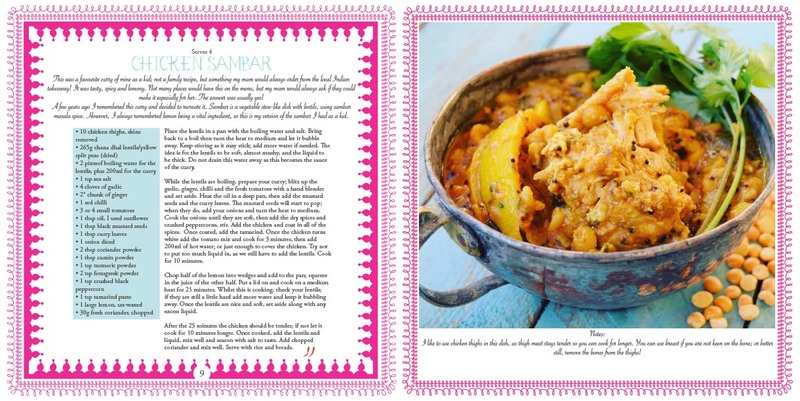 The recipes reflect Lulu’s Indian heritage, intertwined with her very British upbringing, her travels and deep love of Indian foods and spices, all of which translates into a cookbook which should grace every kitchen where there is a longing for the real taste of worldwide flavours. Travel was a massive part of my career in fashion design and I was very lucky to visit a lot of amazing countries and taste foods from all over the world. 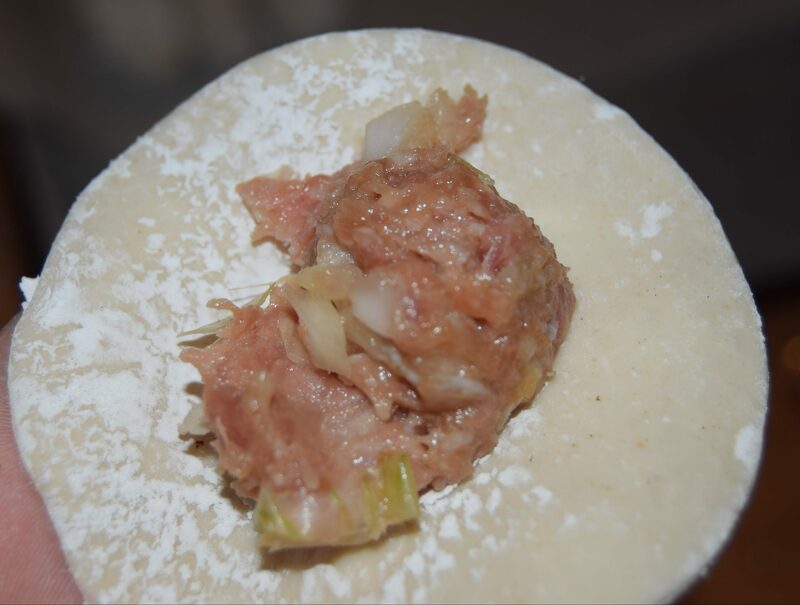 I was however, never keen on the Chinese style dumplings or ‘dim sum’, the jelly like outer case didn’t seem good to me, I wanted to love them as they looked so tasty, everyone around me munched them up and enjoyed them and the aroma of the fillings really did smell good… but I couldn’t get over the texture. 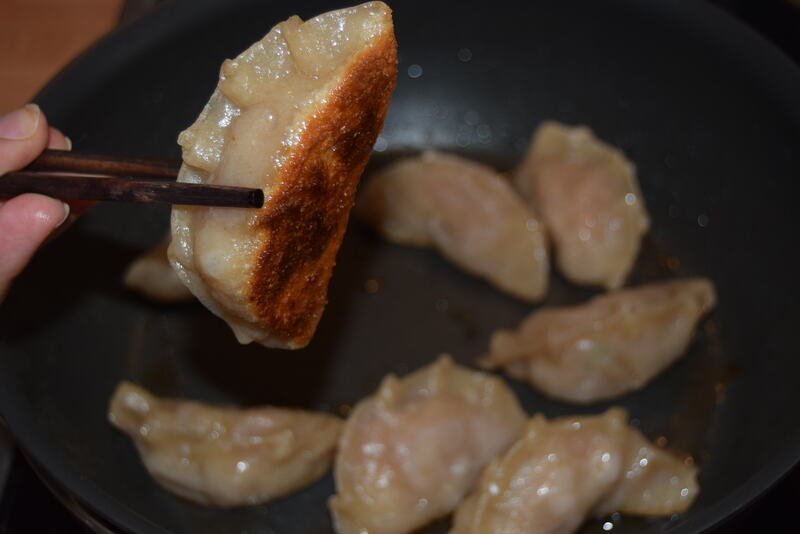 When I first tried a Gyoza; which is slightly fried so it has a crisp and soft texture, I was hooked. These Japanese dumplings are now one of my favourite things to eat, I can literally eat a plate of these in one sitting. The flavour is very clean with a dipping sauce of soy, sesame oil and rice vinegar, giving a very distinct and unusual taste. They are part fried, part steamed so the bottom is crisp and brown and the sides soft and almost silky. 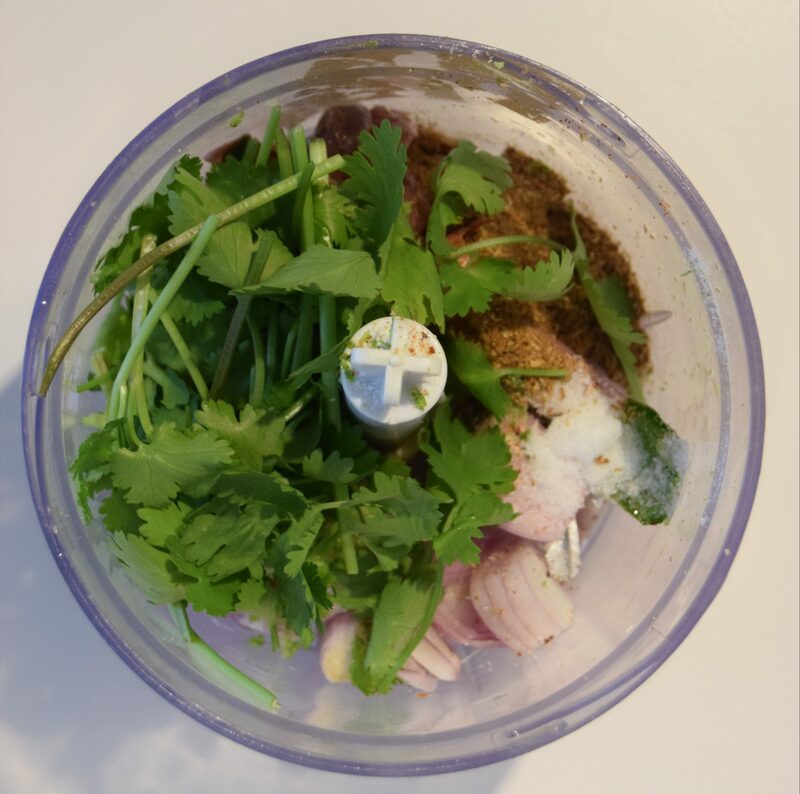 You can fill with anything, pork, chicken, prawns, veggies and just use the same marinade ingredients. They are literally the best and a total crowd pleaser! 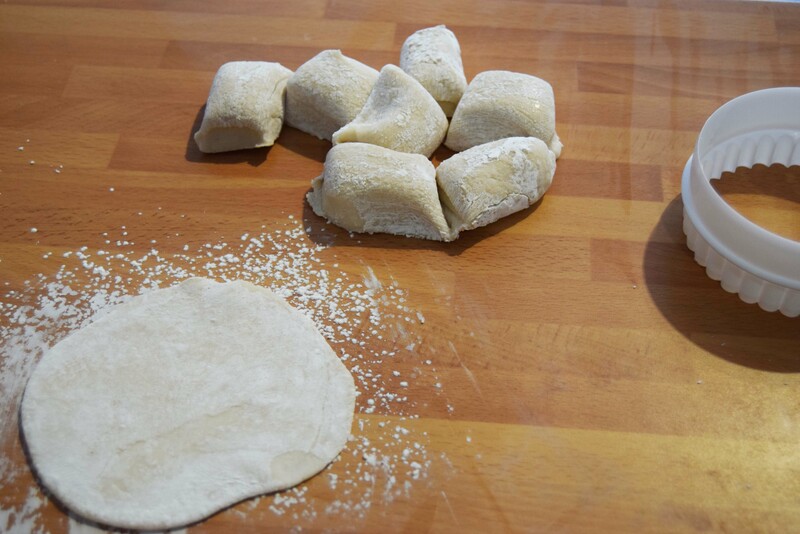 Wraps: sieve the flour and salt then add the water little by little until a dough forms. Need on a clean & floured surface for 10 minutes until you have a smooth dough. Cut into 2 and roll into 2 long logs around 1 ½ inches in diameter. Wrap in cling film and leave to rest for 30 minutes. Meanwhile take the mince and mash up a little more with a potato masher. 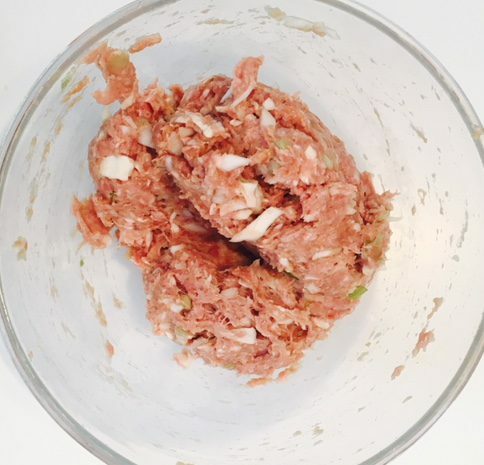 Add the rest of the filling ingredients and mix well with your hands, set aside. 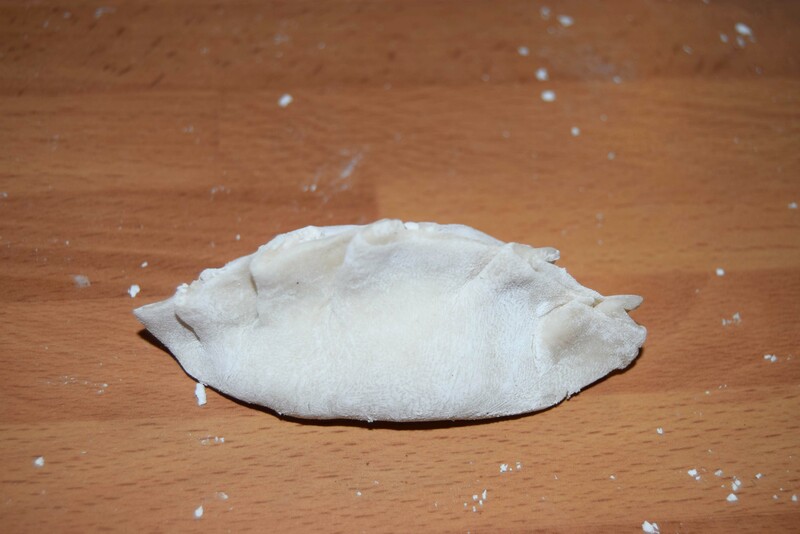 Assemble the gyoza’s buy cutting the dough into 1 inch chunks, roll onto a floured surface (I used cornflour) then with a cookie cutter cut out a perfect circle. My cutter was 78mm. Place the wrap in your hand and with a wet finger wet around the edge. 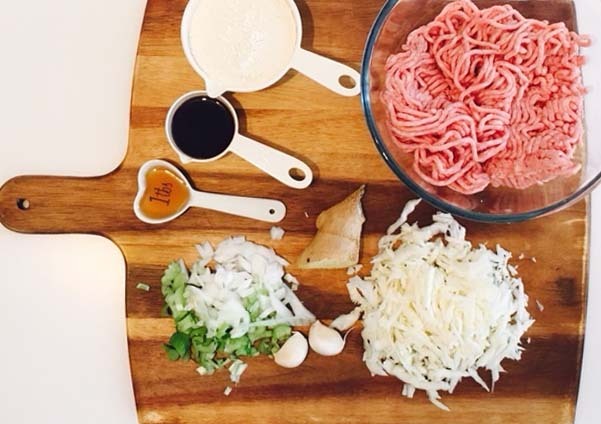 Place a teaspoon of the mince in the centre then fold the wrap in half. I tucked the ends in but this is not essential. 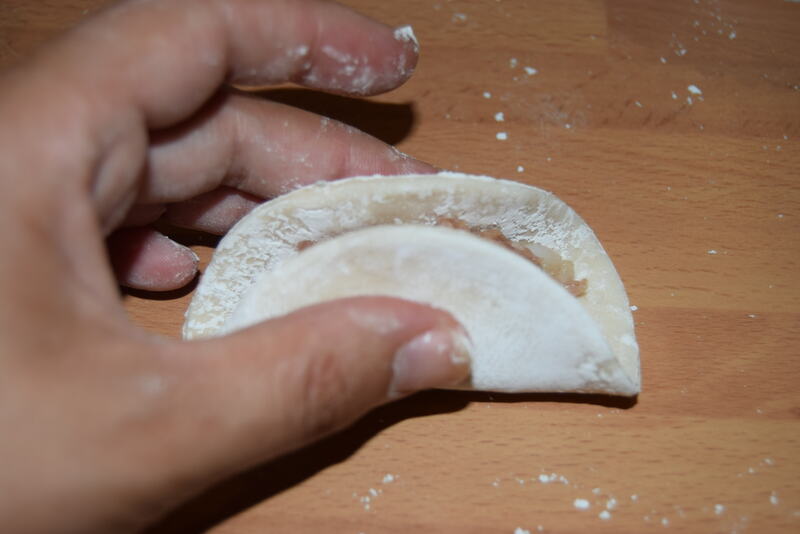 Starting from the centre make folds in the dough to seal. 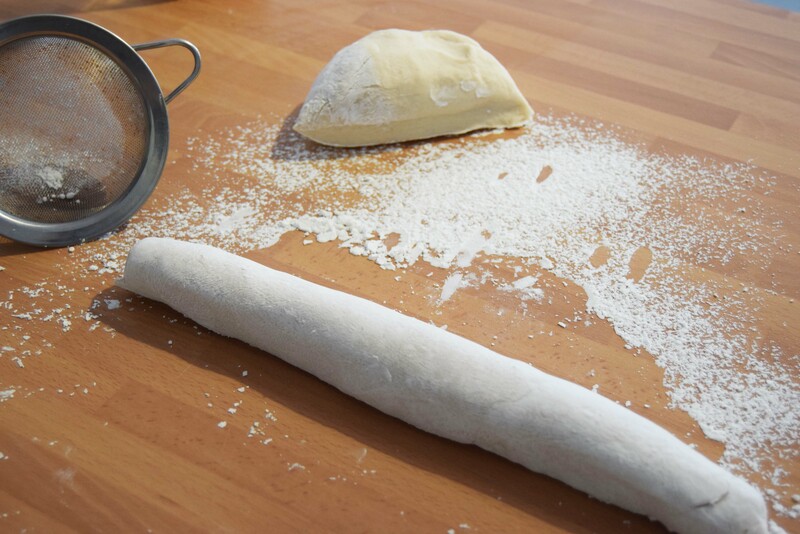 Slightly make an arch in the shape then place onto a baking tray lined with greaseproof paper and dusted with flour. 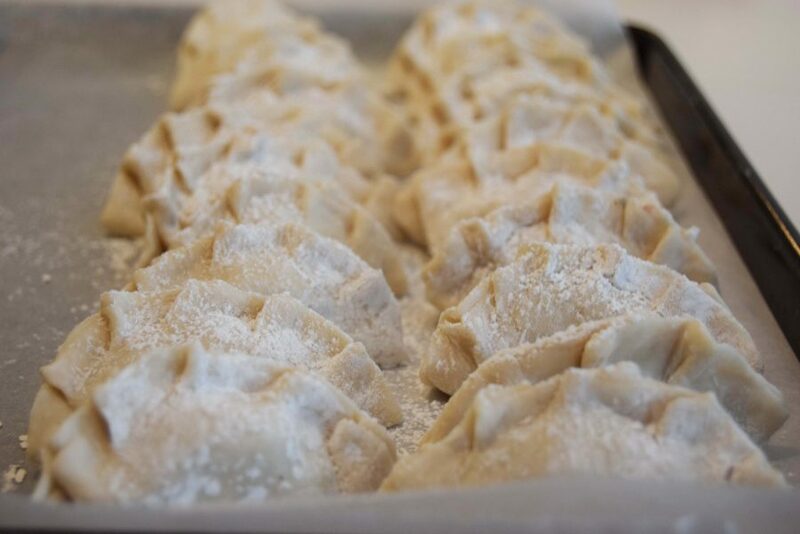 Continue to make the rest of the gyoza’s. Once prepped you can wrap in cling film and store in the fridge until ready to cook. 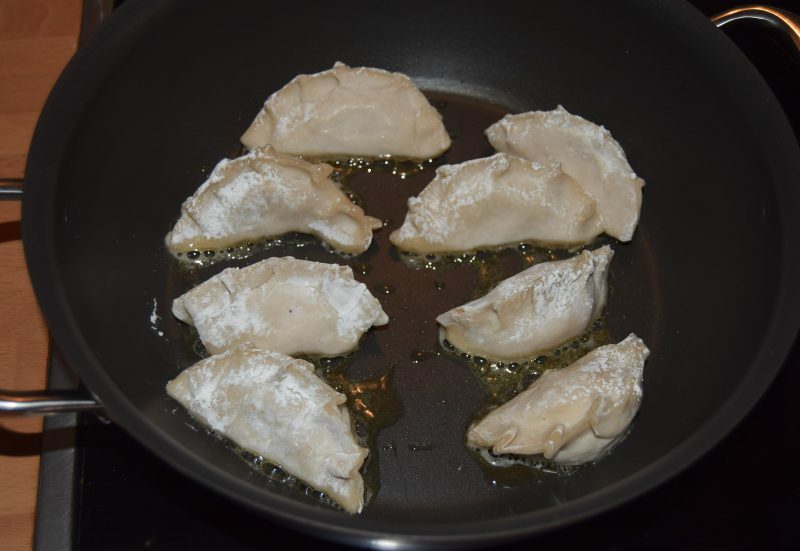 To cook take a pan with a lid, heat up 1 tablespoon of sesame oil, add the gyoza’s around 5 at a time depending on the size of your pan. Place them in the fatter side down and cook for 3 minutes or until the bottom becomes brown. Then add ¼ cup of water and pop on the lid. Keep the heat high and cook for a further 3 minutes. Remove the lid and drizzle in a little extra sesame oil cook for a further minute then serve up with the dipping sauce. You can make this without the mince just blitz up carrots, cabbage and oyster mushrooms then add the rest of the filling ingredients. These Japanese dumplings are one of my favourite things to eat, I can literally eat a plate of these in one sitting. 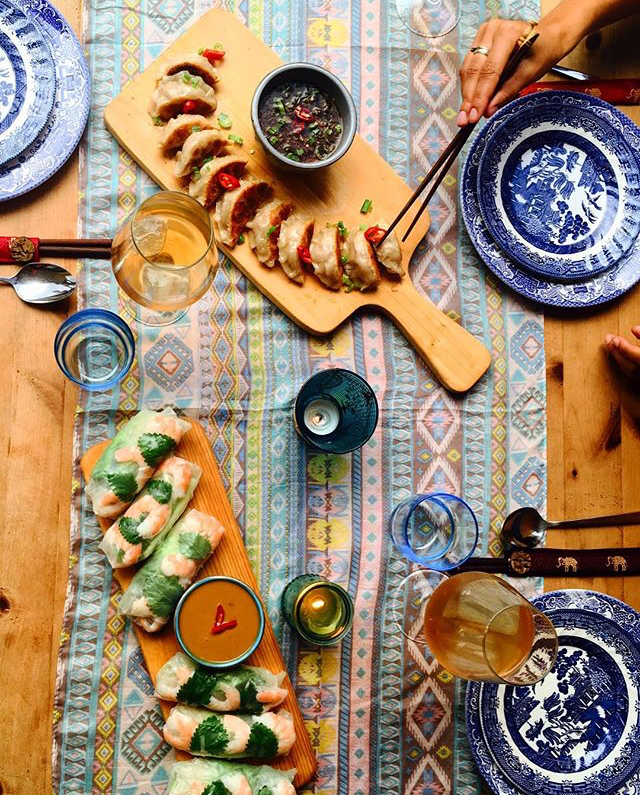 The flavour is very clean with a dipping sauce of soy, sesame oil and rice vinegar giving a very distinct and unusual taste. They are part fried, part steamed, the bottom should be crisp and brown and the sides soft and silky. Place the wrap in your hand and with a wet finger wet around the edge. 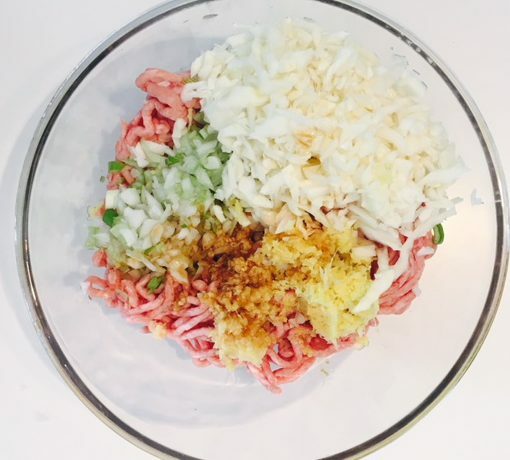 Place a teaspoon of the mince in the centre then fold the wrap in half. I tucked the ends in but this is not essential. 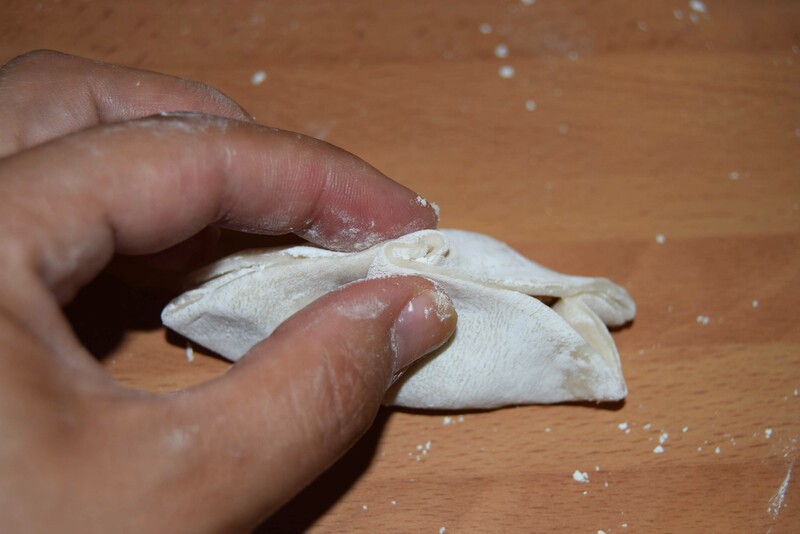 Starting from the centre make folds in the dough to seal. 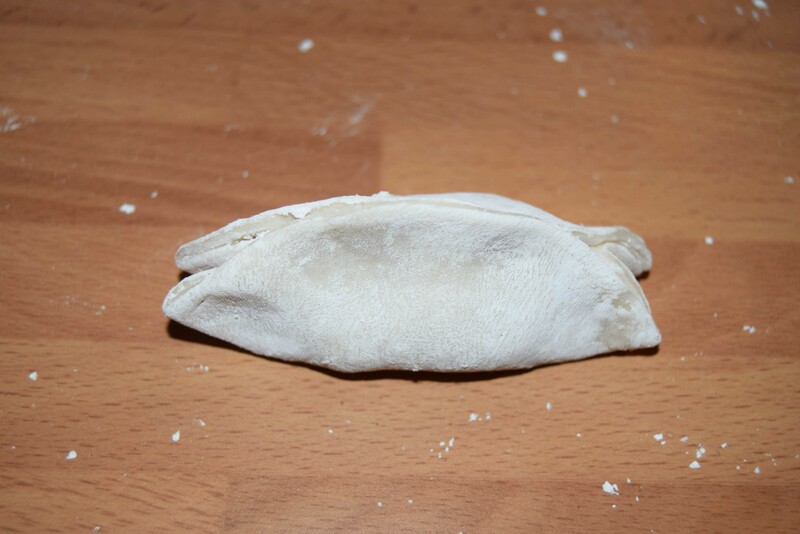 Slightly make an arch in the shape then place onto a baking tray lined with greaseproof paper and dusted with flour. Continue to make the rest of the gyoza’s. 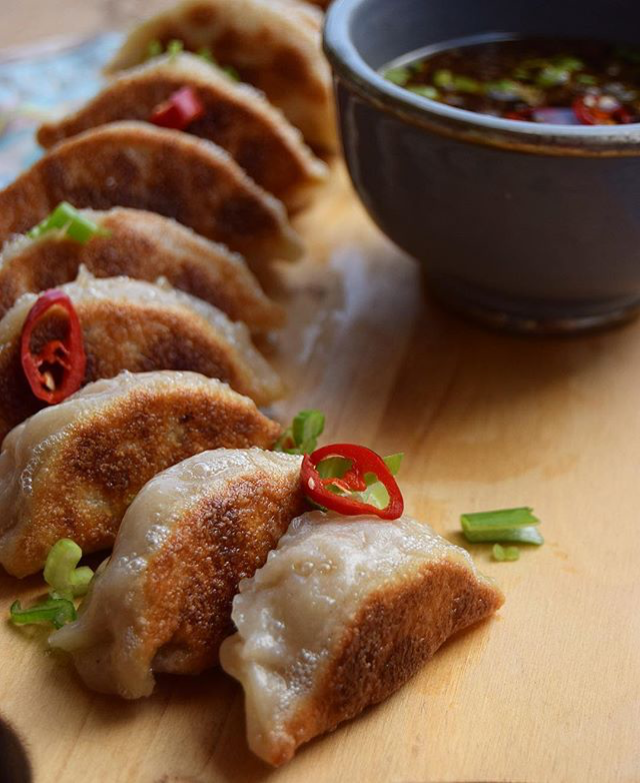 To cook take a pan with a lid, heat up 1 tablespoon of sesame oil, add the gyoza’s around 5 at a time depending on the size of your pan. Place them in the fatter side down and cook for 3 minutes or until the bottom becomes brown. Then add ¼ cup of water and pop on the lid. Keep the heat high and cook for a further 3 minutes. Remove the lid and drizzle in a little extra sesame oil cook for a further minute then serve up with the dipping sauce. I was lucky enough to travel around Thailand a few years ago, and as I LOVE Thai food I decided to visit a cookery school. There they taught us how to make authentic Thai curry pastes and curries and we got to pick out all of our fresh ingredients from the local markets, it was a such and amazing experience. 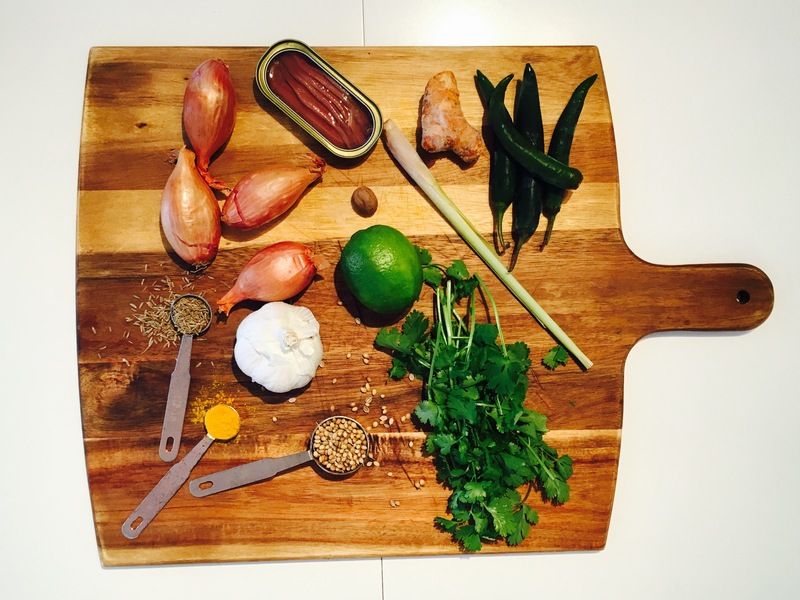 This was one of the recipes, it seriously is one of the best green curries I have eaten. It is so fresh in taste. As some Thai ingredients are not readily available to us I have adapted the recipe using spices that you may be more likely to get hold of. 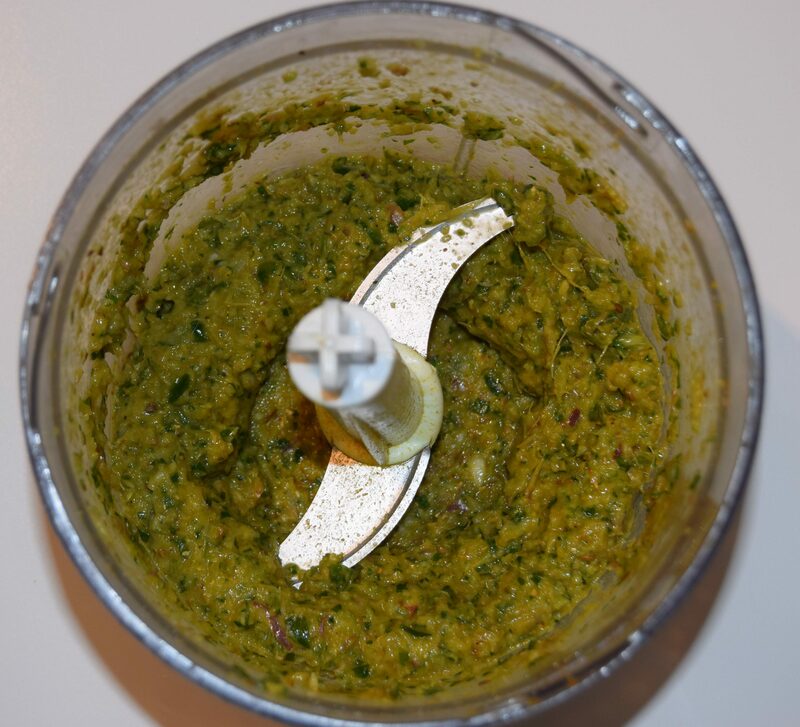 To make the paste, dry fry the cumin and coriander seeds then crush into a powder with a pestle and mortar then pop these and the rest of the ingredients into a hand blender and blitz up to be a paste. Open the tin of coconut milk, what you want is the watery liquid part for now, save the cream for later. It may help to pop the tin in the fridge before opening. Pour this liquid into a wok or deep frying pan, on a high heat reduce this until it becomes an oil. It will happen so stick with it. Once it forms an oil add the shallots and cook for a few minutes until they soften. Add the lemongrass, galangal, whole red chilli, cook for 2 minutes more then add 2 tablespoons of the paste. Fry this for a few more minutes then add you chicken. Coat the chicken in all of the paste, and once the outside of the chicken turns white add the rest of the tin of coconut milk, the sugar and the desiccated coconut. Stir well add a little water if it is too thick. Add the fish sauce and the soy, taste and add a little salt if needed. At this point you can add more chilli if you would prefer it hotter. Add the bamboo shoots and the lime leaves. Cook this until the chicken is cooked, then stir in the fresh coriander. Serve with rice and an extra sprinkle of coriander and desiccated coconut. The sun is shining here in Spain after a little rain this morning. This is a lovely summery dish, tangy from the lemons, and pretty healthy. You can swap the orzo for rice if you can’t find it, or you can just make the bake with vegetables. Have a lovely weekend!! Heat oil and brown the chicken, in bathes if needed. Remove and set aside. Add a tablespoon butter the onions, celery and cook gently until soft. Add the carrot, garlic ginger, bay leaves and chopped rosemary. Cook for 3 minutes more. Add the lemon, the rosemary sprigs, the cinnamon stock and then the chicken back to the pan. Sprinkle the paprika over and mix well. Pour in the stock and honey. Cover and pop into the oven for 30 minutes. 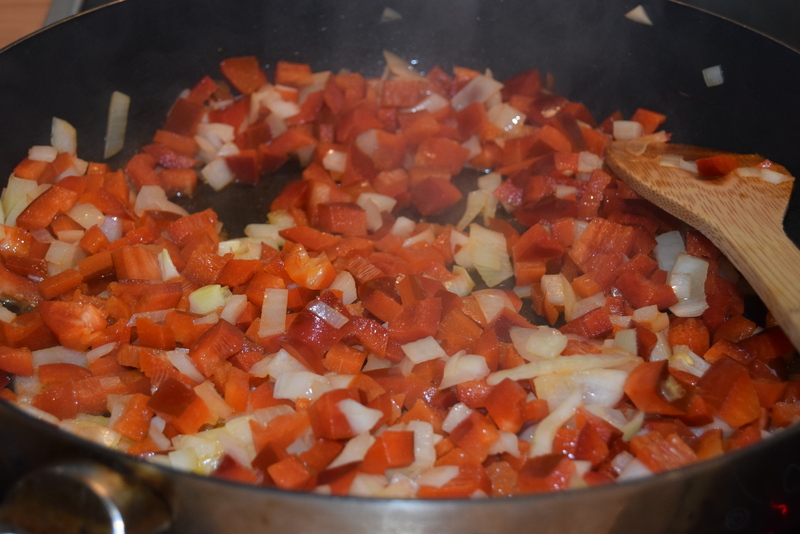 Uncover and sprinkle over the orzo, make sure there is still lots of liquid in the pan, if not add a little more water. Cook for a further 8-10 minutes then add the kale, stir and cook for 5 minutes more. Add the lemon, the rosemary sprigs, the cinnamon stock and then the chicken back to the pan. Sprinkle the paprika over and mix well. 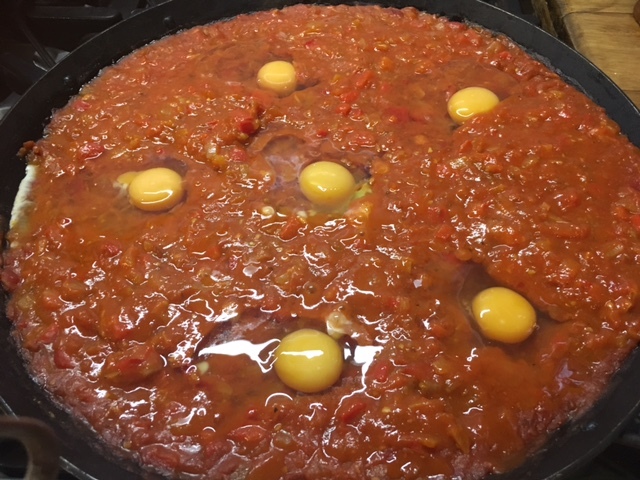 This is a middle eastern dish with tomatoes and eggs, in Arabic the word ‘shakshuka’ means ‘mixture’ Often eaten as breakfast as it has the eggs in, but also is a staple dinner meal all over the middle east. 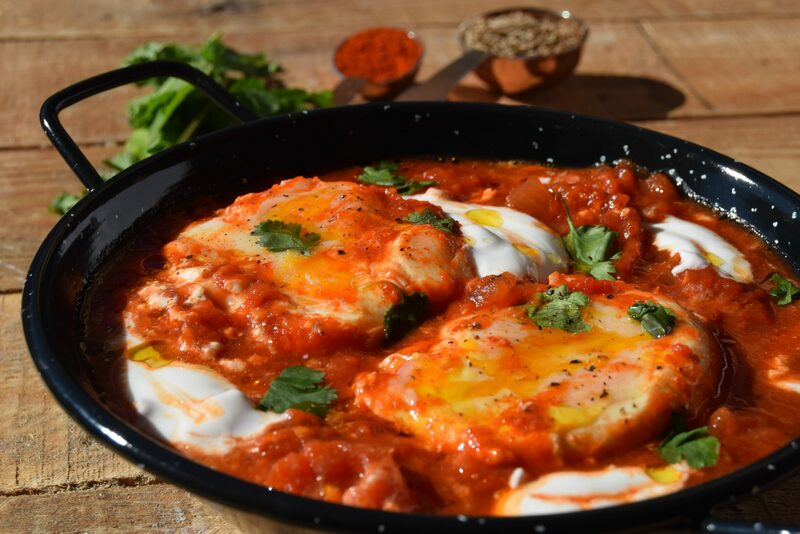 I first tasted this dish in an Israeli cafe in Philadelphia and instantly fell in love, it is a great brunch recipe, and a good filling vegetarian dish. Cut crossed in the tops of the tomatoes and place in hot water so you can remove the skins, dice and set aside. Heat the olive oil in a frying pan, then gently cook the onion and pepper until soft. Add the cumin seeds and cook for a few minutes before add the garlic, harissa, cayenne and paprika. Let this cook for a few minutes more, continue to stir. 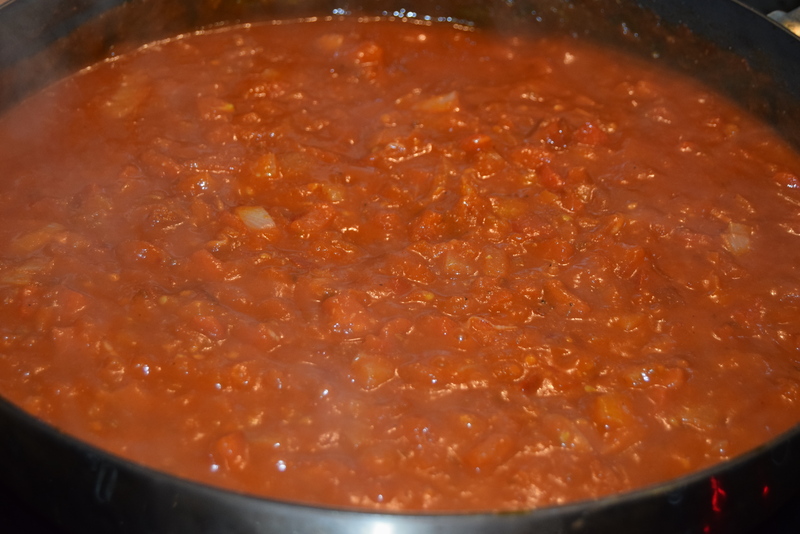 Then add the tomato paste, stir through before add the fresh tomatoes. 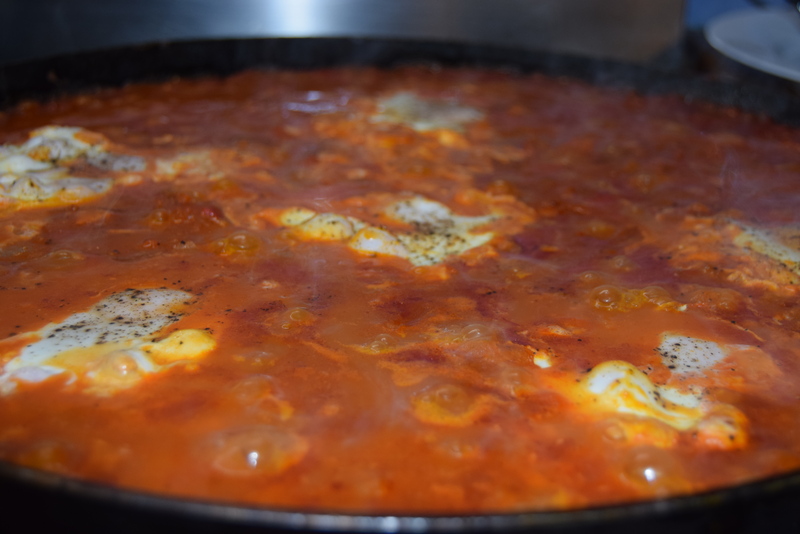 With a potato masher mash up the tomato in the sauce a little bit to break it up. Add the sugar, salt, pepper and lemon juice. Let this cook for 25 minutes. 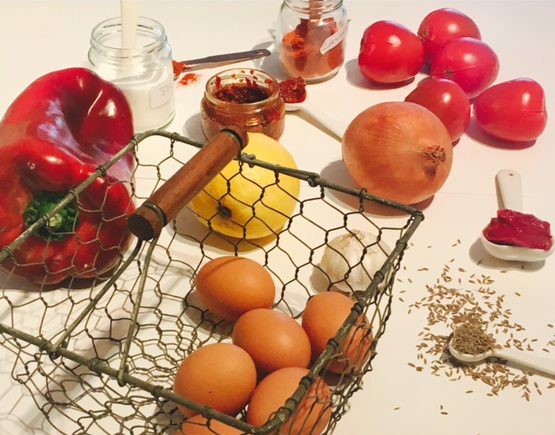 This can be made in advance and reheated once you are ready to cook the eggs. Crack eggs one at a time into a tea cup, then with a ladle make an indent in the hot sauce and gently pour in the egg into the hole, continue will all of your eggs leaving space in between. Turn the heat to the lowest and cover the pan, let the eggs cook gently until all of the white is cooked and the yolk is runny. This should take around 10-12 minutes. When ready serve with a sprinkle of coriander leaves, some dollops of the yoghurt/Labneh ad a drizzle of extra virgin olive oil. Serve with bread. Heat the olive oil in a frying pan, then gently cook the onion and pepper until soft. Add the cumin seeds and cook for a few minutes before add the garlic, harissa, cayenne and paprika. Let this cook for a few minutes more, continue to stir. Then add the tomato paste, stir through before add the fresh tomatoes.